Having been in Spain for the past two weeks I got the chance to discover some excellent new cooking methods, like wood cooked salt baked Sea Bass as well as revisiting some old favourite Andalusian dishes. One of my favorite tapas dishes has to be Patatas Bravas which is traditionally small pieces of fried potato with a chilli sauce. So no sooner was I home I wanted to try and recreate this dish but with my own twist using local ingredients. For the Patatas Bravas I used Mash Direct potato croquettes rather than cubed potatoes. Mash Direct are one of the more well known producers in Ireland selling their range of products around the world. As ever I only feature products that I actually use and Mash Direct is certainly that. Their products are always great quality, fresh and above all convenient. I rate their range of products so highly that I have been feeding my toddler son Mash Direct from the age of 9 months! First the chicken needs to marinade for a couple of hours so coat the bird in olive oil, paprika, chopped garlic and pepper and place in the fridge for at least one hour. 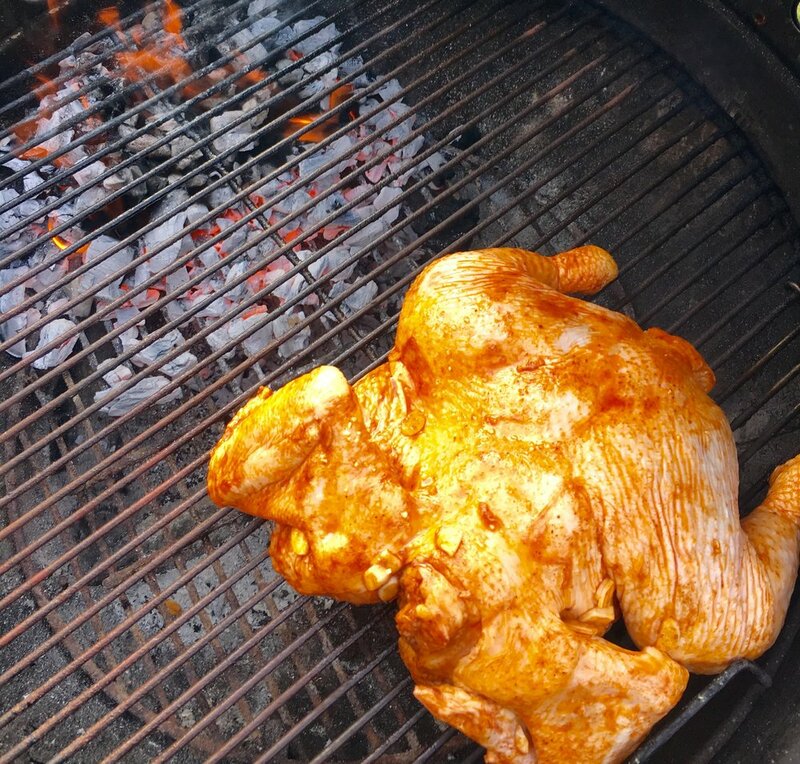 In order to smoke the chicken I used a Weber Kettle BBQ and set the coals up for indirect grilling. This can only be done on a BBQ, oven roasted would be a less favorable alternative. The chicken weighed 1.8 kg and took around 1 hr 50 mins to cook at 170-180c. It is important to turn the chicken half way through cooking so each side is in contact with the heat for the same length of time. 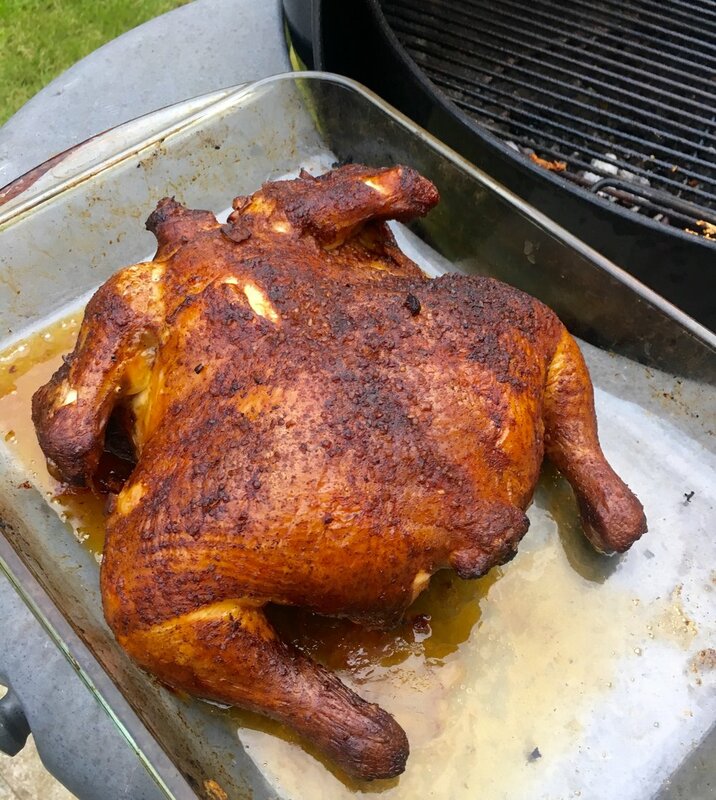 I used lumpwood charcoal (1 chimney) and a couple of hickory chunks which maintained the heat at 170-180c for the first hour. I then added another handful of charcoal for the last 50 minutes. Once cooked remove and let the chicken rest for half an hour. 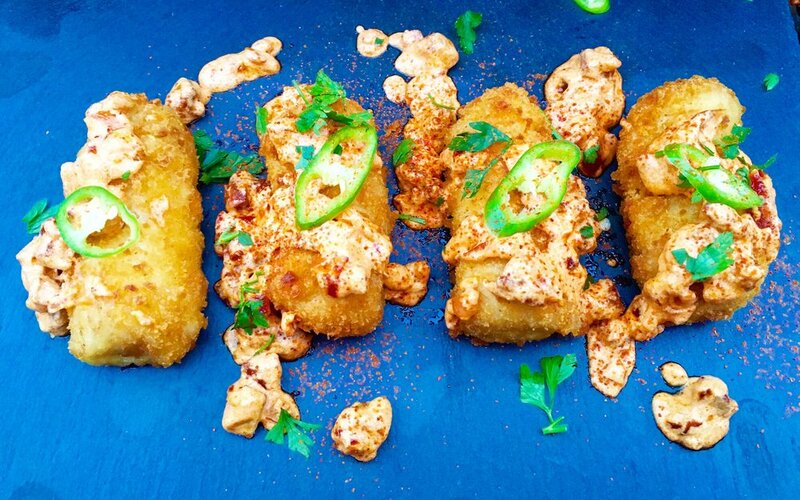 For the Patatas Bravas Croquettes start by placing the croquettes in the oven at 220c and cook for 25 minutes. 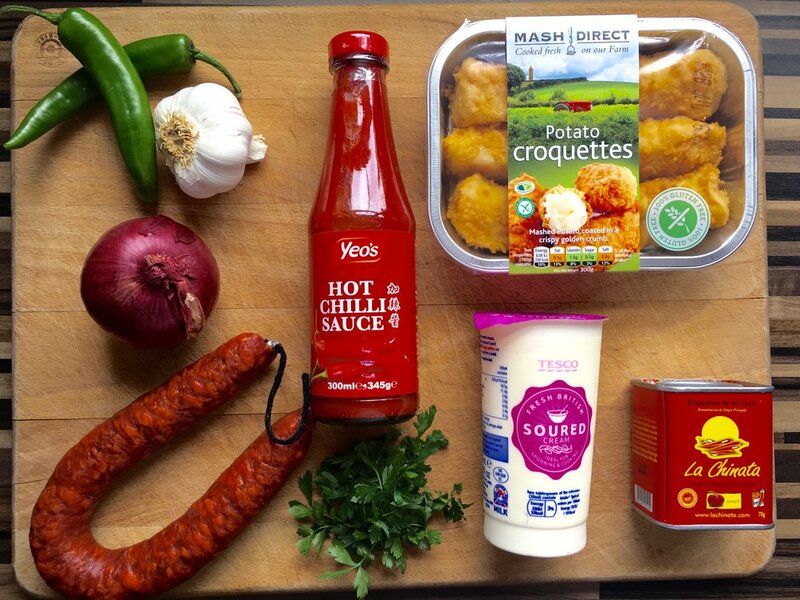 You want to aim the cooking of the bravas sauce to coincide with the cooking time of the croquettes. The sauce takes about 15 mins to cook so start by frying some small cubes of chorizo 10 minutes after the croquettes go in the oven. 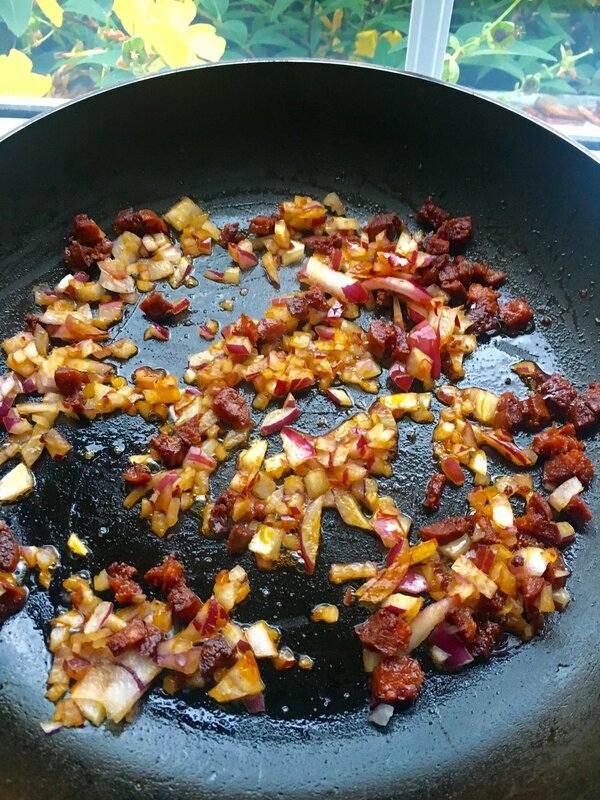 Cook the chorizo for around 6 minutes on medium heat. You want the oil from the sausage to release which will give you the base of the bravas sauce then add the finely chopped red onion reduce the heat and fry for a further 6-7 minutes until translucent. Next add the garlic and the smoked paprika and finally the chilli sauce and sour cream and mix well. You want the sauce to just start to bubble before serving. Chop the chicken as you wish and place on a serving dish along with the croquettes. Drizzle with the Bravas sauce and garnish with fresh parsley and chilli. Simple, flavoursome and a great way to spend a Saturday evening with friends.